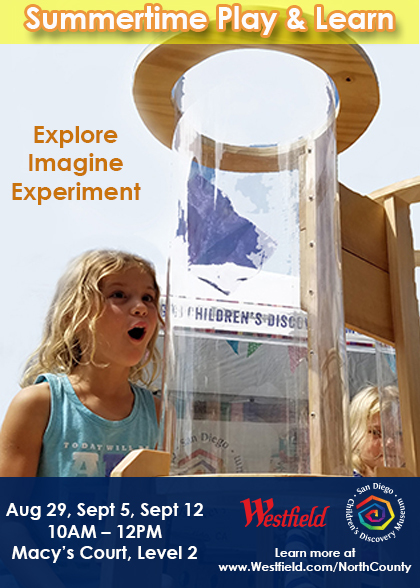 Explore, imagine, and experiment with us August 29th, September 5th, and September 12th at Westfield North County. Museum educators will be onsite from 10:00am to 12:00pm with hands-on science, art, and world culture activities for kids of all ages to enjoy. Take a break at 11:00am and enjoy an interactive storytime followed by a workshop and take-home art project. Snap a picture with your masterpiece and upload to Instagram using #SDCDMWestfieldKidsfor a chance to win a FREE Birthday Party ($450 value)!